Nous y passons tous les soirs. We pass there every night. Notice that to refer to a place previously mentioned in French, you use the pronoun y ('there'). Note also that "y" is placed before the conjugated verb. Tu vas à l'école ? - Oui, j'y vais. Are you going to school? - Yes, I'm going there. Paul est arrivé à Paris hier ? - Oui, Paul y est arrivé hier. Did Paul arrive in Paris yesterday? - Yes, Paul arrived there yesterday. Elle a posé les clés sur la table ? - Oui, elle y a posé les clés. Did she put the keys on the table? - Yes, she put the keys there. Tu passeras par chez elle ? - Oui, j'y passerai plus tard. Will you swing by her place ? - Yes, I'll swing by [there] later. Qu'est-ce que tu mets dans cette boîte ? - J'y mets mes bijoux. What do you put in that box? - I put my jewellery in there. Depuis quand habite-t-il chez Laurent ? - Il y habite depuis janvier. Since when has he lived at Laurent's place? - He's lived there since January. Il vient de la piscine ? - Oui, il en vient. Is he coming from the swimming pool? - Yes, he is coming from there. We go back there tomorrow. «Nous allons en France tous les ans» . Write "We go there every year": Nous ________ allons tous les ans. The correct answer is "Nous y allons tous les ans." 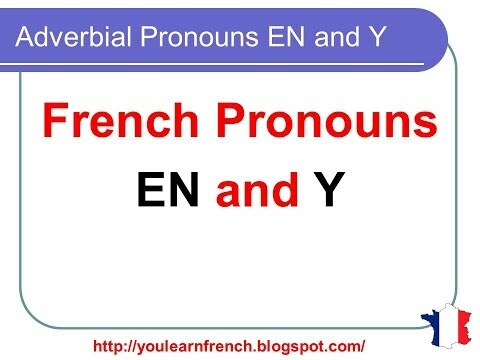 Why does "y" replace "en france" instead of "en. "Lesson states: "Y replaces places introduced with prepositions "à, sur, chez, dans." "Notice that to refer to a place previously mentioned in French, you use the pronoun y ('there')." She'd been dreaming about it forever. The correct answer was "Elle en rêvait depuis toujours." Why wouldn't this be "Elle y rêvait depuis toujours? Wouldn't the words "about it"require "y"and "of it" - en? The short answer is that the verb rêver takes the preposition "de" when we want to say we dream about/of something, and "de" is replaced by the pronoun "en". Elle rêve de son père -> Elle en rêve. Why is elle met les tasses là not accepted for she put the cups there? It's simply because the lesson is about the pronoun "y". You're supposed to practice its use. In general, you are doing something very tempting when learning a foreign language, but something you can never do: you can never take an English sentence, translate each word with a dictionary, and end up with a correct foreign-language sentence. That's just not how grammar works. Foreign languages not only have different lists of words--they have different ways of putting words together into sentences. what if both a and de are there in the sentence what am i supposed to use en or y ? Bonjour Susan ! You will never use both "y" and "en" together in the same sentence. In such a case, you will use either "en" or "y" to replace one of the groups, and keep the original other group. "Je veux des bonbons à la plage." (I want sweets at the beach.) -> "J'y veux des bonbons." (Not my favourite option, it doesn't sound great to my French ears!) -> "J'en veux à la plage." I hope that's helpful! À bientôt ! "You will never use both "y" and "en" together in the same sentence." - I often hear the phrase "Y en a." in response to a question like "Il y a des pommes dans ce magasin? ", for example. Is it then wrong to use "y" and "en" together in the above sentence? Hi Kalonde! It's more likely that you are hearing "Il en a" rather than "Y en a". They sound similar to our non-french ears when spoken fast, so it get us puzzled sometimes! The sentence you hear is "Il y en a" = there are some. This would indeed be the only case where both are present in the same sentence, but only because "y" is part of the fixed expression "il y a" (there is/are). I was under the impression that we replace "à + a place" with "y", but the quiz gives "Elle pose les tasses sur la table." So "y" can replace any preposition + a place? Thanks. Bonjour J, Yes, y can replace any preposition* that indicates a place: à, sur, dans, chez. *Except de, which is replaced by en. Thanks, Laura. I think I'm clear on this, but is there a reason you single out "à + a place" in the lesson? Thanks. Good point, I'll pass this on to Aurélie so she can add some other examples. Bonjour John ! The lesson has now been updated with new examples of cases with "sur, chez, dans". Merci et à bientôt ! Is it correct..j'y peux venir ce soir. Technically, this sentence "J'y peux venir ce soir" is correct to say "I can come there tonight". However, no one French would actually use this formulation. Je peux venir ici (here)/là (there)/là-bas (over there) ce soir.